During the time I’ve been following the 5-2 diet, fish has been something of a mainstay for me. And, I’ve got to know some of the suppliers – in particular John, who runs DelishFish in Petershead, but a few others too. And, over the last few weeks I’ve seen some of my friends getting increasingly incensed at the way their industry is being portrayed in the press. Our lovely island has always relied on fish sourced from our own waters and some of the best British dishes depend on the wonderful, incredibly fresh fish that is landed daily and brought to our plates. Now, the government and the EU determine what quota of fish we are allowed. And, the regulations work by type of fish. It’s all done for the purpose of ensuring that we have genuinely sustainable fish supplies for the future. The problem is, it seems incredibly complicated. Genuine sustainability issues get muddled up with politics. The Marine Stewardship Council is responsible for monitoring and labeling sustainable fish supplies, but even the simplest chart I found from them seems incredibly complex! For those of you who like me, want to support the British fishing industry, I think there are only two things to remember. Firstly – Buy British where ever possible. Apart from anything else, you’ll be supporting the British economy. Secondly – Get to know your British Fish. It’s not just about Cod and Chips. If you are worried about cost, ask your fishmonger or the fish counter at the supermarket for suggestions. One way we can all help the British fishing industry without getting deeply involved in campaigning is by buying fish that isn’t on the restricted quota list. The MSC list does actually help with that, by suggesting alternatives, where the fish you have selected is not regarded as being sustainable. Anyway, enough of the politics. One of my favourite fish is Haddock, particularly properly smoked Haddock. And John at Delishfish has a particularly good Smoked Haddock. This particular recipe is one I developed when I had a yearning for a wonderful Scottish soup called Cullen Skink. Unfortunately, it really isn’t 5-2 diet friendly – it’s made with a lot of cream and mashed potatoes! I have to admit, this is NOTHING like Cullen Skink. It is very nice though and a good comfort dish for a 5-2 diet fast day. 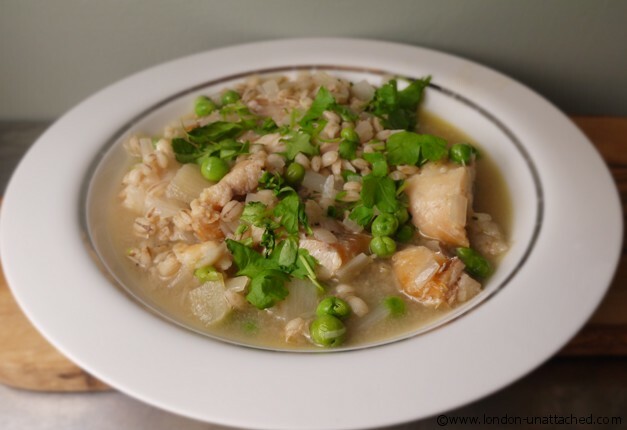 Add the Smoked Haddock and cook for a further 5 minutes before adding the peas (I used frozen ones). 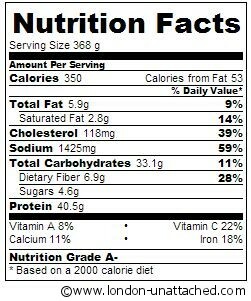 It also comes in at exactly 350 calories. My take on the situation at the moment is to watch and learn. Yes I am watching Hugh’s Fish Fight. But I’m also reading, because there seems to be a lot of media oversimplification in what we see on the TV show. And listening to my friends who fish the the seas around the UK. Just as I’d rather buy British beef, I’d rather buy British fish. Anyone watching tonight’s HFW Fish Fight might just have other reasons for worrying about buying fish that isn’t from UK fisheries. I live in Hull, which is known at Morrison’s fish counter as Haddock Town! Locals prefer haddock way above any other white fish. However, Coley is a great fish to use instead, and its much cheaper. Pollack used to be until it got a bit trendy. I think this would be good with oily fish like mackerel as well – maybe boost the lemon but reduce the fillet size? Mackerel’s good with gooseberries and rhubarb as well – not together though! I still haven’t reached the point where to eat fish regularly, but it’s good to give a thought to what kind of fish you eat. Hm, I’m starting to give it a thought to eat more fish as well.